Our humble beginnings stretch back to the original owners, Mr. & Mrs. Ralph Burkhart. They were truck farmers (vegetable growers) supplying and delivering garden plants for planting and for sale, out of the first greenhouse that Ralph built. Ralph and his son and current owner John L. Burkhart, would go to market in Dayton and Middletown to sell produce. John L. Burkhart began his career at age 16 in the floral business —soon becoming involved with the greenhouse business and eventually the garden center. He and wife Nancy raised 6 children and 3 of the children are involved today in the family business. 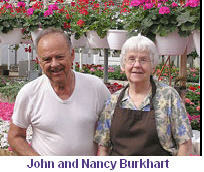 John P. Burkhart began working for his father at age 15 and founded the nursery business in 1975. He and wife Becky have 2 sons, John Luke Burkhart and Caleb James Burkhart, who now help in the business. Craig & Marty Allison are valued staff members and known to most of our regular customers. Marty is a floral designer and interacts with our customers. Craig is involved in almost every aspect of our business and does the majority of ordering for the garden center.